On November 27th, House Speaker John Boehner (R-OH) announced new and returning House committee chairmen (and yes, they are all men). Some of these congressmen will run committees with jurisdiction over federal climate, energy, and environmental programs. This includes funding for the Federal Emergency Management Agency, the Clean Air Act, balancing the use of our public lands between energy production and recreation, and determining the infrastructure needs of a nation that now faces unpredictable extreme weather threats linked to climate change. The vast majority of these chairmen voted for legislation that would dismantle EPA's ability to limit industrial carbon pollution, and for retention of special tax breaks for the oil and gas industry. Oil and gas, coal, and electric utility companies have cozied up to many of these chairmen, giving them roughly $3.8 million in campaign contributions over the course of their careers. Meanwhile, many climate-related extreme weather events have severely afflicted Americans over the past two years, including in their home states. Record-breaking drought and heat waves, severe floods, and heavy storms wreaked havoc for the families living in the chairmens' backyards. Scientists predict that these weather events will become more frequent and/or severe if the industrial carbon pollution responsible for climate change remains unchecked. In a May 2010 op-ed in the St. Louis Post-Dispatch, Rep. Graves claimed that limiting carbon pollution is "out of touch with the people who keep this country running." Yet, the farmers, ranchers, and small business owners he refers to in his column dealt with crippling drought conditions this summer across Missouri and the Great Plains, a disaster that Midwestern scientists say "is consistent with an observed warmer climate." In addition to drought, Graves' home state was also afflicted by other extreme weather events in 2011, including a Missouri River flood that inundated homes and businesses. All of Missouri's counties were declared disaster areas from the three main extreme weather events hitting the state, including the Joplin tornado disaster. Graves has received $150,000 in campaign contributions from electric utilities throughout his career. In his first term as committee chair, Rep. Lucas voted to prevent the Department of Agriculture from helping farmers adapt to a changing climate that will include more droughts, heat waves, and heavy storms. Meanwhile, his home state of Oklahoma suffered from 8 extreme weather events that each caused at least $1 billion in total damages each. Two of these events include the crippling heat and drought conditions that have overwhelmed his home state in both 2011 and 2012. This year's drought recently expanded, and as of November 20th 44 percent of winter wheat crops and 80 percent of the pastures in Oklahoma are experiencing poor to very poor conditions. All of the counties in Lucas's state were declared disaster areas due to the drought. The average household in Oklahoma earns 17 percent below the national median income. The Oklahomans afflicted by the drought and other extreme weather events have less income to recover and rebuild from these episodes. Lucas took $467,325 in oil and gas contributions and $145,992 from electric utilities over the course of his career. Texas experienced 10 extreme weather events with $1 billion plus in damages each in 2011-12. Every single Texas county was in a declared disaster area, and it received more federal disaster aid than any other state since 2009. In his new position, Rep. McCaul will oversee FEMA, including its disaster relief and recovery efforts, which should be comforting to Texans. But Rep. McCaul voted to approve the 2013 House Budget Plan that would have handicapped the government's ability to respond to disasters, something he openly criticized when it affected his district. McCaul asserts, "It shouldn't have taken that long," for FEMA to respond to wildfires that spread through Texas in 2011. He has not acknowledged that he would support government efforts to cut back the program even further. Rep. McCaul received $300,000 in oil and gas contributions throughout his career. Rep. Rogers' committee is hostile to disaster relief and recovery. It voted to slash FEMA's budget by $87 million (2011) and $182 million (2012). Budget cuts restrict FEMA's ability to provide disaster relief, food and shelter, and flood management assistance for state and local governments. Roger's home state of Kentucky suffered from four separate tornado and severe storm events in 2011-12 with at least $1 billion in damages each. Half of Kentucky's counties were in declared disaster areas from the four events, and households in these counties earn, on average, 19 percent below the U.S. median household income. Rogers has received over $830,000 in campaign contributions from fossil fuel industries throughout his career. Over the past two years, Rep. Ryan voted more than a dozen times to block Environmental Protection Agency public health rules, including pollution reduction measures that would limit carbon pollution from power plants. While serving as Budget Committee Chairman, Rep. Ryan authored a budget that would have hurt FEMA's ability to help state and local governments repair or replace damaged infrastructure after a major disaster. Although his budget does not mention FEMA by name, the plan would have cut discretionary federal funds to FEMA and other agencies. The reductions in the FEMA budget would have shifted a significant portion of disaster response and recovery costs to states and cities. Rep. Ryan's home state of Wisconsin experienced three billion-dollar in damages weather events in 2011-12. Nearly two-thirds of its counties were in declared disaster areas. Ryan received $263,600 in campaign contributions from oil and gas companies throughout his Congressional career. As Climate Progress recently reported, Rep. Smith is the new chair of the Science Committee. Yet he does not accept the overwhelming scientific consensus on man-made climate change. In fact, Rep. Smith has repeatedly attacked the media for reporting on the mountains of scientific evidence confirming this fact. Smith claims that they are "determined to advance the idea of human-made global warming." While Rep. Smith seeks to assert that climate change is just an "idea," his state has continued to suffer from the impacts of climate related extreme weather. Texas has experienced more billion-dollar in damages weather events than any other U.S. state in the past two years. The 2011-12 droughts decimated Texas crops, threatened the state's water supply, and severely harmed its cattle industry. Ironically, while pollution-fueled climate change helped cause severe economic losses in his state, Rep. Smith assured Americans that "oil and natural gas fuel our economy and sustain our way of life." Rep. Smith is heavily supported by the oil and gas industry. It is his second largest contributor, shelling out half of a million dollars on his campaigns over the course of Rep. Smith's career. The Energy and Commerce Committee oversees many aspects of energy production and industrial pollution. Rep. Upton will head it up again. He has repeatedly said that he does not believe climate change is man-made, even though he used accept this scientific fact. Upton became a fierce critic of the EPA's authority to limit industrial carbon pollution. In fact, he authored the "Energy Tax Prevention Act" (H.R. 910) to amend the Clean Air Act by repealing the scientific "endangerment finding" by EPA that greenhouse gases endanger human health. This bill would have permanently prevented EPA from limiting climate change pollution. Upton, claimed that "this legislation will remove the biggest regulatory threat to the American economy," without any independent analysis to demonstrate this claim. Months after working to get the bill through the House, multiple severe weather events hit Michigan in July 2011, causing $1 billion in damages. Rep. Upton received $1.2 million- more than any other House committee chair - over the course of his career from the electric utility and oil and gas industries. Jackie Weidman is a Special Assistant for Energy Policy at the Center for American Progress; Whitney Allen is an intern on the energy team at the Center for American Progress. The destruction of Amazon rainforest reaches its lowest level since monitoring began 24 years ago, the Brazilian government says. Climate advocates celebrated after winning nearly every Congressional race they targeted during the national elections, including four of the "Flat Earth Five" climate deniers in the House of Representatives. But with the balance of power essentially the same in Washington, many rightly worried that little would change moving into the 113th Congress. Case in point: yesterday's nomination of Representative Lamar Smith (R-TX) to chair the House Committee on Science, Space, and Technology - a body with jurisdiction over many laboratories, NASA, the National Science Foundation, and the National Weather Service. "We now know that prominent scientists were so determined to advance the idea of human-made global warming that they worked together to hide contradictory temperature data. But for two weeks, none of the networks gave the scandal any coverage on their evening news programs. And when they finally did cover it, their reporting was largely slanted in favor of global warming alarmists. The networks have shown a steady pattern of bias on climate change. During a six-month period, four out of five network news reports failed to acknowledge any dissenting opinions about global warming, according to a Business and Media Institute study. The networks should tell Americans the truth, rather than hide the facts. In fact, independent reviews found that climate scientists neither hid nor tampered with data. Compared to the outgoing chair of the committee - Texas Republican Ralph Hall - Smith has been a bit more "moderate" in his skepticism of climate change. Last year, Hall said he doesn't "think we can control what God controls" and explained that he wasn't concerned about global warming because he's "really more fearful of freezing," even though "I don't have any science to prove that." Smith acknowledges on his website that the climate is changing; however, he does not mention the overwhelming consensus within the scientific community that humans are responsible. Over his political career, Smith has received $500,000 from oil and gas. And just last year, he received $10,000 from Koch industries. A British MP revealed to be holding $400,000 worth of share options in an oil firm while sitting on an influential parliamentary climate change committee is also being paid $300 an hour to advise an Indian company building a coal fired power station, DeSmogBlog has discovered. Veteran Conservative MP Peter Lilley has billed the New Delhi-based Ferro Alloys Corporation Limited (FACOR) for at least 220 hours of consultancy advice and is still working for the group. It emerged in The Guardian last week that self-described "global lukewarmist" Mr Lilley, a director with Tethys Petroleum, was also holding $400,000 worth of share options in the company which is drilling for oil and gas in Kazakhstan, Tajikistan and Uzbekistan. As The Guardian reported, Mr Lilley is also paid by Tethys to attend meetings and provide advice and has received about ¬£47,000 (US$75,000) in the past year. The UK Parliament's register of members' financial interests shows that in the period from January to June this year, Mr Lilley racked up 228 hours of work for Tethys, FACOR and IDOX plc, a document management company where he is also a director. The register shows how Mr Lilley was paid ¬£37,696 (US$60,360) for 220 hours of "advice on the management and flotation of a power generating subsidiary" by Ferro Alloys Corporation Limited between July 2011 and June 2012. FACOR is building a 100MW coal fired power station at Randia in the state of Orissa in eastern India to provide electricity to its ferro alloys plant, with excess power being sold to the grid. Mr Lilley's latest payment from FACOR suggests an hourly rate of ¬£187 (US$300). The payments from Tethys and FACOR come on top of Mr Lilley's annual MP's salary of ¬£65,738 (US$105,000). Mr Lilley has recently been appointed to the UK Parliament's Energy and Climate Change Committee, which examines the policies of the government's Department of Energy and Climate Change. Environment groups criticised the appointment, which has been seen as a sign that "anti-green" forces were gaining hold on the UK's Conservative Party. In a response to questions from me, Mr Lilley confirmed his work with FACOR was continuing. I asked if his work with the oil and coal sectors represented a conflict of interest, "given your position on the climate committee in a parliament as internationally influential as the UK." I also pointed out that the "peer reviewed literature would suggest that coal power is detrimental to the climate". Can you suggest any policies of the UK government which this Committee exists to scrutinise which have, will or conceivably might affect the profitability of an Indian power company or for that matter an oil company whose operations are entirely in Central Asia? Far from a conflict of interest, my knowledge of the Energy sector (I was a financial analyst specialising in the Energy sector before becoming a minister) is helpful - for example at today's hearings of the Committee I was able to point out that there is no obvious reason for the British government to give the oil industry special tax breaks to incentivise shale gas development, as others assumed. I imagine the only reason anyone should raise the absurd suggestion of a conflict of interest is because they are unable to refute the views I have expressed on the Economics of Climate Change and therefore have to resort to innuendo. I am sorry you have so little faith in your position that you need to resort to that. Mr Lilley also attached a copy of a report he authored for the Global Warming Policy Foundation, a climate sceptic group founded by Lord Nigel Lawson, a former chancellor in the Margaret Thatcher government. The report criticised the UK Government's perceived reliance on the Stern Review on the Economics of Climate Change. Mr Lilley's interests in Tethys and his lucrative consultancy work for FACOR are not disclosed in the report. Bob Ward, policy and communications director at the Grantham Research Institute on Climate Change and the Environment at London School of Economics and Political Science, has said Lilley's GWPF report was based on "misrepresentations and bad economics". The GWPF, which claims to be non-political, has refused to disclose its funders but it was revealed earlier this year that one financier was major Conservative Party donor and billionaire Michael Hintze, an Australian-born UK-based hedge fund manager. Several requests to FACOR for comment went unanswered. Graham Readfearn is an independent journalist based in Queensland, Australia, with 15 years experience as a reporter and writer on newspapers, magazines, radio and online. This piece was originally published at DeSmogBlog and was reprinted with permission. The inimitable Dave Roberts of Grist had a good interview with Al Gore this month. The Climate Reality founder discusses "carbon taxes, natural gas, and the 'morally wrong' Keystone pipeline." Since a carbon price is the sine qua non of reality-based climate policy, and Gore has been way, way ahead of the curve, I'll excerpt that portion. At the end, I'll also comment on Grist's comment policy and Gore Derangement Syndrome. Q. Did you hear [White House press secretary] Jay Carney this morning? A. No, God help us, what'd he say? Q. He said, "We would never propose a carbon tax, and have no intention of proposing one." A. I don't think that comes as a big surprise to anyone. Those of us that hold out some hope that we will find a way to get a price on carbon, and know there are multiple ways to do it, have felt that the convergence of the fiscal cliff and the climate cliff could produce some surprising results. And there have been some private comments by some Republicans to that effect. But certainly that's something you wouldn't wanna bet money on in Vegas. Q. What do you think of this idea of a revenue-neutral carbon tax? A. I have proposed a revenue-neutral carbon tax for a long time, 30 years. I proposed it in my first book, Earth in the Balance. I supported cap-and-trade because a lot of folks felt that it offered the opportunity for bipartisan consensus. And by the way, it may yet gain altitude globally - China, as you know, is implementing it in five provinces and two cities. They have indicated that they intend to use these pilots as a model for the nationwide program. Many are skeptical, but they often do follow through with what they say they're going to do. And [cap-and-trade] just started in California yesterday. Australia is now linking theirs to the E.U. system. South Korea's moving, British Columbia, Quebec - there are a lot of parallel developments that could converge, particularly if China does follow through. It's premature to write [cap-and-trade] off, even thought it's has been demonized and so many people are afraid to talk about it. But from the very beginning, I preferred a carbon tax. (And by the way, I'd be in favor of both; I don't think they're inconsistent at all.) And yet, the political environment in the U.S. has not changed to the point where it's something you'd wanna bet on. But look, we've got to solve this. It's an irresistible force meeting an immovable object, and something's gotta give. I have enough faith in humanity to believe, against a lot of evidence, that we're going to solve this. Q. Does this idea of a carbon/income tax swap make you nervous? The income tax is one of the only places we have progressivity in the U.S. tax code. A. I have not proposed doing it on the income tax, I have proposed doing it on the payroll tax. I am also friendly to the notion of a rebate scheme, though I doubt they'll do that. It needs to be progressive - the rising inequality in the country is too serious to run the risk of worsening that. A. Well, they come after anybody who speaks up in favor of doing something on climate. It's not going to surprise any of them that I'm in favor of it. I've said it on practically a daily basis for years and years. Gore's last answer is dead on. The anti-science crowd demonizes all climate hawks. That is hardly a reason for silence by any hawk on any aspect of climate science, solutions, or policy - quite the reverse. Certainly the public opinion data makes clear that Nobel laureate did not polarize the climate debate - and every leading social scientists in the field I've spoken to agrees (see "Public Opinion Study Debunks Claim Al Gore Polarized the Climate Debate"). Despite the fact that the science continues to support a worse-case analysis than the one Gore advanced in An Inconvenient Truth, the vitriol against him continues to this day, so much so it has its own label "Gore Derangement Syndrome." And if you want to see an epidemic of GDS, just go to the comments section of the Grist interview - but put on your head vise first. That may be the best argument I've seen in a while for moderating comments, which the overwhelming majority of blogs do. I'm a huge fan of Grist's - they reprint Climate Progress pieces and we reprint theirs - but I'd urge them to at least put an intern on that job. What really is the point of a comments section if it can be overwhelmed by those spreading disinformation and/or Gore Derangement Syndrome? The water that sloshes through city pipes can both quench your thirst and generate electricity. However, the latter is far less common. But that's the proposition from startup Rentricity, which has developed equipment that uses water pressure to produce electricity and helps water suppliers reduce their energy costs. The New York City-based company was the runner-up for the grand prize in this year's Cleantech Open competition and has seen its technology installed at two water treatment plants in the Pittsburgh region and one in Keene, New Hampshire. Its biggest project, its fourth one, is scheduled to come online in the first quarter of 2013 in the Palos Verdes area of Los Angeles County. Rentricity's technology makes use of the highly pressured water that flows through pipes to be delivered to neighborhoods. After leaving the treatment plant, water typically goes through the water utility equivalent of substations (concrete underground regulator vaults) where the flow and pressure are reduced as the water gets ready to enter the smaller pipes of homes and businesses. 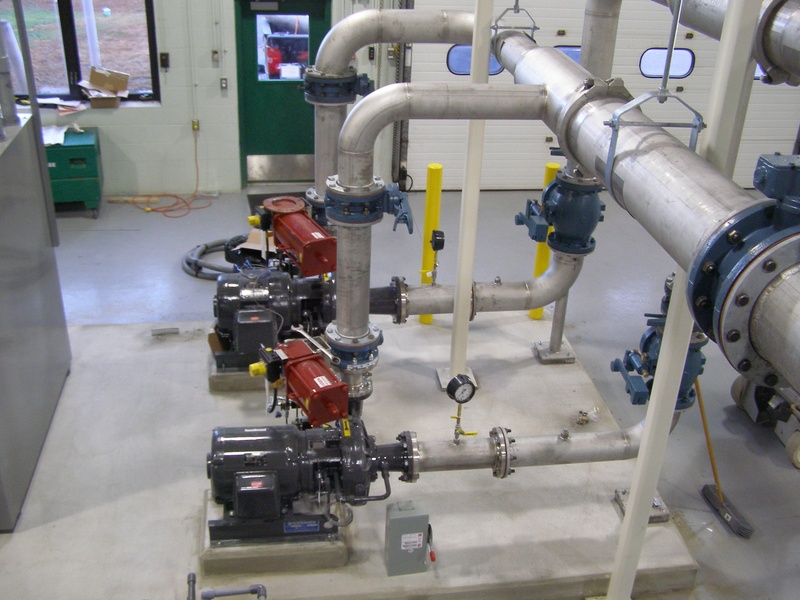 The company's technology includes a reverse pump, a generator, and controllers that would typically be installed at a water treatment plant or underground vaults. The pump harnesses the highly pressurized water and sends that through the generator to produce electricity. The controllers monitor and manage the valves and make sure the electricity moves on to the grid. 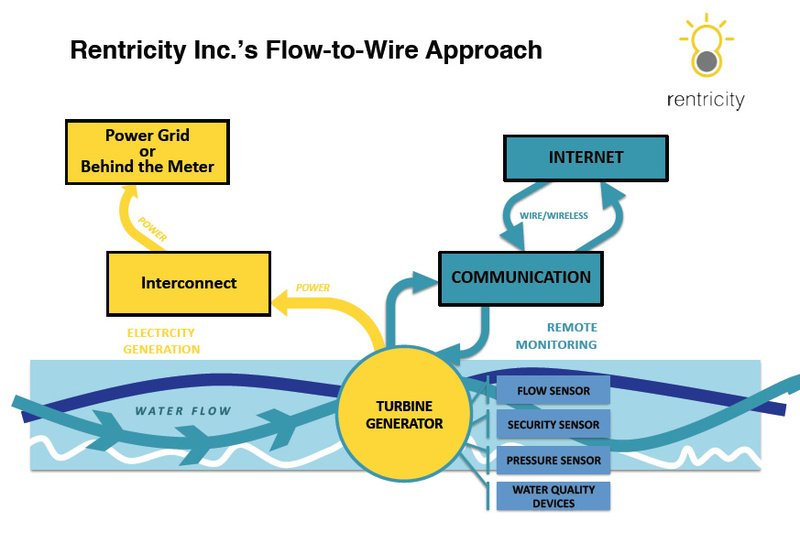 "We can monitor, control and optimize the pressure in the system so that we can get the most electricity potential out of the system," said Frank Zammataro, the company's CEO and founder. The gear is designed to handle pipes from 10-inch to 36-inch in diameter; the generators range from 30 KW to 350 KW. Rentricity also has designed equipment in the 5-30 KW range in a partnership with water pump and treatment equipment maker Xylem. The two companies are looking at demonstrating the new gear in two sites, located in Pennsylvania and Nova Scotia, Canada. Rentricity's intellectual property lies in the control system, Zammataro said. Rentricity also can install flow and pressure sensors that collect data and detect leakage for water utilities, particularly if the water treatment systems are located in remote areas. The company is targeting selling its technology to water utilities at the moment, though it would like to see its equipment installed at industrial sites that use a lot of water, such as pharmaceutical plants, food and beverage factories or mining operations. Knowing that the upfront financing is often a hurdle for new infrastructure technology - especially for municipal water utilities - Rentricity began offering financing options to customers earlier this year. The financing makes the company the sole or co-owner of the power generation equipment for the 30-40 years of expected lifespan of the gear or until the water utilities pay to own it. In return, Rentricity gets a share of the revenue from selling the electricity. Zammataro said he's talked with three fund managers who are interested in providing the money for the installations, but he declined to name them. Rentricity has signed a letter of agreement to finance a 100 KW system with the city of Albany, New York, Zammataro said, and is now in the process of doing due diligence. The company hasn't finalized the budget for the project but estimates that it could cost somewhere between $500,000 and $1 million. Rentricity, the name of which is a mash up of "renewable" and "electricity," was founded in 2003. But the company was a "part time project" for the three co-founders, Zammataro said. It wasn't until 2008 when the company began to market its technology to water utilities in earnest, he said, that the project became a full time gig. Rentricity has been self-funded and raised $1.5 million from friends, family and government grants. The company is working on raising a $3.5 million round. Yesterday, New York Governor Andrew Cuomo declared that his state needs $42 billion to recover from Hurricane Sandy and to protect against future extreme weather events. Three quarters of this sum is just for damage repair and restoration of homes, businesses, and mass transit. New Jersey Gov. Chris Christie also announced that Sandy caused $29.5 billion in economic costs there, cautioning that the estimate will likely rise after next summer's tourism season and real estate values take a hit. Cuomo urged that mitigating damage from future storms is essential, as climate change increases the frequency and severity of extreme weather. "There has been a series of extreme weather incidents," Cuomo said just days after Sandy's landfall. "We have a new reality when it comes to these weather patterns." Senator Charles Schumer (D-NY) warned that obtaining federal funding for recovery efforts could be difficult, especially during the fiscal showdown. Schumer said that an emergency supplemental appropriations bill will be introduced in December and that it "will be an effort that lasts not weeks, but many months, and we will not rest until the federal response meets New York's deep and extensive needs." Additionally, the House of Representatives hasn't been friendly to disaster relief. In both 2011 and 2012, the Republican-controlled House Appropriations Committee proposed cutting the Federal Emergency Management Agency (FEMA) budget by $87 million and an additional $182 million, respectively. This isn't the first time that states have asked Congress for disaster funding, and it certainly won't be the last. FEMA only has $12 billion in disaster aid to provide annually. Yet in 2011 and 2012, the U.S. experienced at least $126 billion in direct costs just from extreme weather events that caused $1 billion in damages or more. A recent Center for American Progress report called "Heavy Weather: How Climate Destruction Harms Middle- and Lower-Income Americans," finds that the vast majority of U.S. counties - 67 percent - were affected by at least one of the 21 billion-dollar extreme weather events in the past two years. The report found that lower- and middle- income households are disproportionately affected by the most expensive extreme weather events. Although New Jersey and New York account for the lion's share of damages from Hurricane Sandy, they aren't the only states slammed by extreme weather. Sixteen states were afflicted by five or more extreme weather events in 2011-12. Households in disaster-declared counties in these states earn $48,137, or seven percent below the U.S. median income. These states were ravaged by hurricanes and tropical storms, tornadoes and severe thunderstorms, floods and crippling drought. After Superstorm Sandy, droughts are the second and third most costly extreme weather events in 2011-12, respectively. Extremely dry conditions over the past two years resulted in long drought seasons that caused at least $40 billion in economic damages combined. This year, the worst drought in decades continues to ravage the south-central United States. Drought conditions expanded and intensified this month after retreating in September and October, according to the November 20 drought monitor. Eric Luebehusen, a meteorologist with the Agriculture Department told E&E News that this could be the worst winter wheat season since 1995, as dry conditions deplete irrigation storage and stifle secondary root growth. A Purdue University economist estimates that the 2012 drought will cause up to $77 billion in economic costs, and experts at the University of Illinois predict that taxpayers will ultimately be responsible for at least $10 billion of them. These are just some of the costs that extreme weather has inflicted on the U.S. economy in recent years. Lasting effects are felt on national, state, and local levels as families must rebuild destroyed homes, small business owners suffer from loss of business, and states scramble to come up with the funds for recovery. Hurricane Sandy is the exclamation point on the warnings about climate change, after the deadly and expensive extreme weather events repeatedly struck the United States in 2011 and 2012. We are not helpless victims on the receiving end of a suddenly angrier climate; these recent weather events are a call to action and preparation. Jackie Weidman is a Special Assistant for Energy Policy at the Center for American Progress. Autism is a cause of growing concern in the scientific community, with more and more children seemingly diagnosed with one of the many mental disabilities that fall under the autism label. While researchers have linked autism with obvious culprits like industrial food processing, a new study suggests a strong link between high amounts of traffic pollution and children born with autism. The study, headed by Dr. Heather E. Volk of the University of Southern California Keck School of Medicine, showed that pregnant women exposed to high levels of traffic pollution were twice as likely to give birth to a child with a developmental disorder. Young children exposed to high levels of traffic pollution were also three times as likely to develop autism. While the researchers are quick to point out this isn't conclusive evidence, it backs up previous findings by other researchers. The emissions coming out of the tailpipes of automobiles are indeed quite deadly. If anyone suggests otherwise, I tell them to stick their mouth over a tailpipe of a running car for five minutes. This is just one more argument for a move away from a fossil fuel-based economy. We will all be better off when automobiles run cleaner, allowing everyone to breathe a little easier. The post Traffic Pollution Linked To Autism...Again appeared first on Gas 2. A large LNG tanker is set to become the first such carrier to sail across the Arctic taking advantage of changing climate conditions. Obama can't keep pushing climate away. President Barack Obama raised expectations for climate action when he said in his election night acceptance speech that "we want our children to live in an America that isn't threatened by the destructive power of a warming planet." But in his first post-election press conference, he backed away, implying that climate must take a back seat to dealing with the country's economic woes - a distinction echoed by his spokesperson Jay Carney shortly thereafter. The President is exactly right in his first statement and dead wrong in his second. Sweeping action to address climate change faces enormous political opposition, especially when the economy is the dominant issue of the day. But the reality is that they can be approached simultaneously. In fact, this decision to separate the economy and the environment is a marked reversal from the president's previous statements. "There will always be people in this country who say we've got to choose between clean air and clean water and a growing economy, between doing right by our environment and putting people back to work. And I'm here to tell you that is a false choice. That is a false choice. With smart, sustainable policies, we can grow our economy today and protect our environment for ourselves and our children." In addition to addressing the urgent need to curb our carbon emissions, the economic benefits of dealing with climate change should merit their inclusion in both short-term policy discussions about deficit reduction and long-term economic growth strategies. For example, a recent analysis from the Congressional Research Service found that a modest carbon tax of $20 per ton that rises 5.6 percent annually could cut the projected 10-year deficit by 50 percent - from $2.3 trillion down to $1.1 trillion. If designed correctly, a carbon tax could help shift the burden of paying for pollution (and solutions to it) from taxpayers to polluters, as well as generate much-needed revenue that could be used for a variety of purposes, including paying down the debt, incentivizing clean energy, and building our resiliency to climate change. Investment in energy efficiency is a win-win for the climate and the economy. The U.S. wastes an estimated $130 billion a year on inefficient buildings and appliances, an obvious and costly drag on the economy. Buildings consume nearly 49 percent of all energy in the economy and emit nearly half of total carbon emissions. A 2011 CAP analysis found that retrofitting just 40 percent of the nation's residential and commercial building stock would create 625,000 sustained full-time jobs over a decade - especially in the hard-hit construction and manufacturing sectors - generating as much as $64 billion per year in cost savings for U.S. energy ratepayers. As climate change diminishes our natural resources, efficient use of lands and oceans will benefit both the planet's health and the country's economy. On public lands, conservation-related industries - such as tourism, recreation, and renewable energy development - have enormous economic value and job creation potential. The same can be said for the various sustainable ocean and coastal industries that fuel our nation's blue economy - with coastal restoration in particular providing a tremendous opportunity to create jobs across a wide range of skill sets, diversify local economies, and help protect coastal communities from the increasingly severe storms that result from climate change. Though significant action to address climate change will require a substantial investment, failure to act will be far more costly. A new World Bank report released yesterday carried the dire warning that we're on track for a 4¬∞C warmer world by as soon as 2060, a catastrophic scenario "marked by extreme heat-waves, declining global food stocks, loss of ecosystems and biodiversity, and life-threatening sea level rise." With the impacts of pollution currently costing us $500 billion a year and climate destruction already hurting lower and middle-class Americans the most, the implication that climate action would come at the expense of economic growth becomes even more glaringly off-base. Far from distinct and unrelated, climate and the economy are inextricably linked. The transformation from a predominantly carbon-intensive economy to one built on clean energy will be an enormous undertaking, but one that bears vast potential for job creation, economic diversification, and equipping communities to cope with the devastating impacts of climate change. This shift is not an option. It is imperative. Last week the International Energy Agency released its annual World Energy Outlook report which made headlines for projecting that the U.S. could become the world's largest oil producer by 2020. The much bigger story, however, is their warning that over 2/3 of the world's proven reserves need to still be in the ground in 2050 in order to prevent catastrophic climate change. A new PriceWaterhouseCooper study echoed this urgency, concluding we need to quadruple our current rate of decarbonization in order to avoid the absolutely devastating 4¬∞C scenario. We must aggressively deploy clean technologies, internalize the actual price of pollution by putting a price on carbon, and make major investments in climate resiliency. In short, the time for piecemeal solutions has passed. When it comes to finally tackling climate change head-on, rhetoric will not suffice. It is no longer an option to continue kicking the can down the road, hoping for a better political climate or more stable economy. As David Remnick writes in the New Yorker, Obama must escape the dangerous Washington mindset that believes "a difficulty delayed is a difficulty allayed" because in the case of climate change, "there will not be a better time. There will only be worse times." The President must stop separating climate action from economic well-being. It's a wrong - and dangerous - policy stance. Kiley Kroh is the Associate Director for Ocean Communications at the Center for American Progress. The UK bird population has declined by 44m birds since 1966, according to a report carried out by conservation groups. 27 or younger? Then you've never experienced a month in which the global temperature has been colder than average, according to the latest data from the U.S. National Oceanic and Atmospheric Administration. Two things have happened since the obscure holiday of St. Crispin' day, October 25, this year. First, Hurricane Sandy emphatically reset the American conversation on climate change. A recent cover of Bloomberg Businessweek was "It's Global Warming, Stupid!" Second, the presidential candidate who understands climate science and wants to take action has been elected. In his victory speech Obama said: "We want our children to live in an America that isn't threatened by the destructive power of a warming planet." In history, St. Crispin's day happens to have marked two legendary battles where armies overcame overwhelming odds. The U.S. and Australia's improbable victory, outgunned and outnumbered, at Leyte Gulf during World War II, was one. And in 1415 at Agincourt, Henry V and his men used longbows to defeat the numerically superior French forces. It's worth noting that the catastrophic Charge of the Light Brigade also happened on St. Crispin's day, reminding us that great boldness often carries great consequences. Perhaps this year, St. Crispin's day marked another improbable victory against all odds: The date when Americans finally started talking about realistic paths to climate solutions. It has become abundantly clear that adaptation, the climate solution recommended by Rex Tillerson, CEO of Exxon, is a joke and a myth. "Adaptation" looks like lower Manhattan under four feet of water. The upside of that harsh truth is that government officials like Michael Bloomberg, Andrew Cuomo, Obama, and maybe even Chris Christie, are beginning to realize what conservative Yale economist William Nordhaus has been saying for years: It's going to cost more not to deal with climate change than to fix it. With that in mind, and knowing that Obama does see climate as a huge problem, it's possible he could pursue actual legislation to reel in carbon emissions. The right path wouldn't be tepid support for a wildly complex fraud-incubating cap and trade program. Rather, it would be a creative, bipartisan policy fix supported by the left and by Grover Norquist Tea Partying Republicans. The approach, proposed by a group called Citizen's Climate Lobby and suggested in similar form by climatologist James Hansen, is a fee on carbon at the wellhead or mine, refunded back to the consumer. "Fee and dividend" looks like your heating, electric, and car fillup costs going up by, say, $50 each month (though the cost could rise), but a check for the same amount arriving at your mailbox every quarter. The idea: create a revenue-neutral market incentive for our economy to decarbonize, without adding a new tax. The right likes this approach because it's not a tax and because it creates a market incentive to fix climate. The left likes it because a carbon fee is the sine qua non of fixing climate change. Will this alone slow the rise of the oceans? Of course not. But it's the first step, it signals intent and creates policy certainty, and China will take notice. A simpler approach - a straight tax on carbon - is now gaining traction as part of a deal to fix the fiscal cliff. Even though the above policy fix makes wonks drool, it would be pretty bold for Obama to go after climate directly, given the insane partisanship in the country, and the outsized bickering around this issue.... So perhaps he needs to tackle it obliquely, the same way Americans won the Battle of Leyte Gulf, forced into using smaller, nimble ships to fight more powerful opposition forces. A policy version of this tactic might be to attack climate from the sides, through tax reform, which both John Boehner and Obama see as necessary. Most economists agree our tax system is broken. It's a Rube Goldberg device that does nothing well and a lot of things badly. Annual compliance costs alone are in the hundreds of billions of dollars, more than the economies of many nations. Left, right, and center agree with William E. Simon, the former Treasury secretary, who said that "the nation should have a tax system that looks like someone designed it on purpose." So let's do something everyone agrees we need to do, and in the process, start taxing bads instead of goods: pollution instead of income. Again, a carbon tax won't solve all our problems, but it's the sine qua non of climate fixes, and a market signal and a message to China and India that the U.S. is now moving on climate, and they can follow or be left in the dust. Perhaps tax reform is just too big a lift. Why not go after El Jefe of all problems - one both right and left have aspired to fix - the problem of money in politics? As with Henry V at Agincourt, we'd need both luck and strategic brilliance to pull this off. But if we did, as Shakespeare's King Henry said: "From this day to the ending of the world, we in it shall be remembered!" Currently, politicians can't simply make the right decision, they have to make the decision that will allow the dollars to keep flowing in. This is madness. It means soul crushing 24/7 fundraising, and limited time to actually govern. What if, after the dust settles from this election, both parties asked the question: "Were we happy spending a billion dollars each to achieve nothing?" We've certainly proved the Mutual Assured Destruction of unlimited campaign spending. Publicly financed elections create a better world, allowing our elected officials the time and freedom to actually govern, to make the right decision, not the one that protects fundraising, and allows citizens and businesses to spend their money on things they really care about, like schools and churches, food banks and medicine and children. If you fix money in politics, you start to fix climate, and health care, and energy subsidies, and key problems with our democracy. Money in politics is the great structural failure of our republic. People on the inside of the sausage factory tell me this is crazy talk, and that campaign finance reform can never happen, because the people who benefit most from the money - the lobbyists - are in charge. Perhaps even tax reform and climate legislation are themselves similarly impossible propositions. Slate Magazine Staff Writer Will Oremus summed up how a lot of folks in the climate advocacy community were likely feeling this afternoon after Obama's first post-election press conference, in which he was asked about climate change. There's been a lot of talk in Washington in recent weeks about the possibility of a carbon tax proposal from Congress or even the White House. Along with the fact that the Obama Administration says it is not planning such a proposal, Obama's response in today's press conference shows that broad action on climate probably isn't very high up on the priority list at the moment. While he did say he wanted to do more on climate in his second term, Obama gave few specifics about what a plan might look like. Q: Thank you, Mr. President. In his endorsement of you a few weeks ago, Mayor Bloomberg said he was motivated by the belief that you would do more to confront the threat of climate change than your opponent. Tomorrow you're going up to New York City, where you're going to, I assume, see people who are still suffering the effects of Hurricane Sandy, which many people say is further evidence of how a warming globe is changing our weather. What specifically do you plan to do in a second term to tackle the issue of climate change? And do you think the political will exists in Washington to pass legislation that could include some kind of a tax on carbon? PRESIDENT OBAMA: You know, as you know, Mark (sp), we can't attribute any particular weather event to climate change. What we do know is the temperature around the globe is increasing faster than was predicted even 10 years ago. We do know that the Arctic ice cap is melting faster than was predicted even five years ago. We do know that there have been extraordinarily - there have been an extraordinarily large number of severe weather events here in North America, but also around the globe. But we haven't done as much as we need to. So what I'm going to be doing over the next several weeks, next several months, is having a conversation, a wide-ranging conversation with scientists, engineers and elected officials to find out what can - what more can we do to make short-term progress in reducing carbons, and then working through an education process that I think is necessary, a discussion, the conversation across the country about, you know, what realistically can we do long term to make sure that this is not something we're passing on to future generations that's going to be very expensive and very painful to deal with. I don't know what - what either Democrats or Republicans are prepared to do at this point, because, you know, this is one of those issues that's not just a partisan issue. I also think there's - there are regional differences. There's no doubt that for us to take on climate change in a serious way would involve making some tough political choices, and you know, understandably, I think the American people right now have been so focused and will continue to be focused on our economy and jobs and growth that, you know, if the message is somehow we're going to ignore jobs and growth simply to address climate change, I don't think anybody's going to go for that. If, on the other hand, we can shape an agenda that says we can create jobs, advance growth and make a serious dent in climate change and be an international leader, I think that's something that the American people would support. So you know, you can expect that you'll hear more from me in the coming months and years about how we can shape an agenda that garners bipartisan support and helps move this - moves this agenda forward. Q: It sounds like you're saying, though - (off mic) - probably still short of a consensus on some kind of - (off mic). PRESIDENT OBAMA: I - that I'm pretty certain of. And look, we're - we're still trying to debate whether we can just make sure that middle-class families don't get a tax hike. Let's see if we can resolve that. That should be easy. This one's hard. But it's important because, you know, one of the things that we don't always factor in are the costs involved in these natural disasters. We'd - we just put them off as - as something that's unconnected to our behavior right now, and I think what, based on the evidence, we're seeing is - is that what we do now is going to have an impact and a cost down the road if - if - if we don't do something about it. Nothing shocking here. Don't expect anything ground-breaking on climate coming out of Washington anytime soon. "Climate change is an extremely important issue for me and I hope we can address it reasonably. It's something, as we've seen with these storms that are overwhelming our country and the world, we need to do something about it." Reid now has a much stronger hand. Democrats picked up 2 seats in the Senate. A few months ago Republicans were thought to have a good chance of seizing control of the Senate - now they have undercut their chances of taking back the Senate even in 2014. And newly elected Senators Angus King (I-ME) and Elizabeth Warren (D-MA) both explicitly campaigned on climate change. "We want our children to live in an America that isn't burdened by debt, that isn't weakened by inequality, that isn't threatened by the destructive power of a warming planet." So a carbon tax will be a high priority of Obama's and the chances of a carbon tax being part of the debate is 20% - or higher - but the chances of it actually passing are low. Hope that clears things up for you. In fact, while everyone I talk to in DC thinks the chances of a carbon tax are below 50-50, ultimately if the President insists on a carbon tax, it has a serious shot - and Stanco's three points of opposition are each incomplete. First, it's certainly true many conservatives would oppose any new tax, which is why Obama and Reid would have to put on the table something in return that conservatives want - such as a lower corporate tax. Indeed, as I will explain in a subsequent post, many in Washington think the only way to have any kind of grand deal on taxes is to simply let all the Bush tax cuts expire. That will happen automatically at the end of this year if the House and Senate can't agree on a package that the president will sign in time. In that scenario, the subsequent 2013 deal can be billed as the biggest tax cut in history - and throwing in a carbon tax and lower corporate tax rate wouldn't change that. Second, a carbon tax is certainly somewhat regressive. But we are probably talking about a tax that is under 1% of GDP - a key point I will elaborate on in subsequent posts - so it won't be a burden on most individuals. And it is perfectly straightforward to rebate some of the tax to those in lower income brackets to eliminate the regressivity. This is certainly not a show-stopper. Third, environmental groups would be delighted to have a carbon tax - they certainly won't oppose it because the money might be used to pay down the debt (or even to lower taxes for corporations and lower income groups). Also, if there is a grand bargain on taxes it would probably include a final set of tax credits for wind energy and other renewables. I for one would much rather have a permanent carbon tax then permanent clean energy tax credits, especially since the latter have proven anything but permanent. I'm not saying this deal would be easy to construct and pass through the House and Senate. I'm only saying that one can certainly design a carbon tax as part of an overall tax package to minimize opposition. It then becomes a matter of how much the President and Senator Reid insist that it be part of the final deal. "There has been a series of extreme weather incidents. That is not a political statement, that is a factual statement ... Anyone who says there's not a dramatic change in weather patterns, I think, is denying reality." Truthfully, I think I'd just as soon see statements like that as carefully thought-out endorsements of climate science. It's experience that changes people: the summer's drought left more than half of American counties as federal disaster areas, and meteorologist Jeff Masters estimates Sandy hit 100 million Americans with "extreme weather". Add in the largest forest fires in Colorado and New Mexico, the hottest month in US history, and the completely absurd summer-in-March heatwave that kicked off our year of living sweatily, and you can begin to understand why the percentage of Americans worrying about global warming has spiked sharply this year. Spiked high enough that even a few politicians are willing to speak out. Not many. The presidential candidates avoided the topic at all their big public forums - except for Romney's Republican national convention joke about how silly it was to try and slow the rise of the oceans (which probably didn't win him many votes on the Jersey Shore this week). Obama did talk climate with MTV last week, but that venue almost defines the issue's fringe status; his other real discussion of it was with Rolling Stone - global warming is, apparently, only for people with earbuds. As the richest industry on earth, and the biggest political player, the boys from coal and oil and gas have bought one party and terrified the other. Last week - in the very final days of the US election - Chevron smacked down the single largest corporate donation in the Citizens United era,$2.5m to a GOP Super Pac. There's not a congressman who didn't notice, and who didn't think: what if they came after me with ten days to go? Which is why 350.org sent out an email blast today, raising money for the Red Cross and raising signatures for a petition to oil execs asking that they stop their campaign donations and spend the money repairing New York instead. And it's why we launch a road show next week. We'll go to 20 cities in 20 nights, trying to spark a movement for divestment from fossil fuel stocks, and a new willingness to stand up to the industry. It starts next Wednesday in Seattle, and we'll do it no matter who wins the White House next Tuesday night.